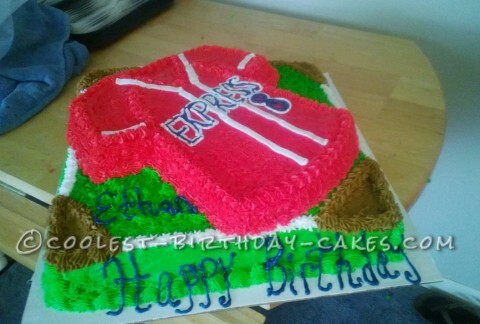 This Baseball Jersey birthday cake was made at the request of an eight year old who wanted a cake of his own personal baseball jersey. The inside of the cake was made from three French Vanilla cake mixes. They needed the cake to feed about 40 people so I decided to make a cake underneath (this particular one was 14×14 inch square pan). The jersey (which was made in a shirt shaped cake pan) and make it look like a baseball field and lay the jersey cake on top. Both cakes are decorated with your basic butter cream icing. And then I divided the icing and used Wilton icing to color the icing to the desired colors. Wilton cake decorating tips 3 and 5 were used for outlining and writing. Tip 16 was used to give the star textured look to the cake. And tip #233 was used to make the green icing look like grass. The cake received many compliments.